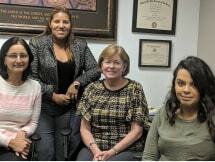 ScottVassell & LeeCC Law Firm has a dynamic team of immigration attorneys and legal professionals who serve businesses, individuals, and families. Our clients are highly valued. We realize that people's very lives and businesses depend on solid aggressive immigration representation. An attorney and case manager is assigned to each client's case as part of our outstanding client service approach. Clients are continuously updated on their case status and developments in U.S. Immigration law that affects their case. Our group is known for its culture of personable and accessible attorneys. Our lead immigration attorney immigrated from Canada herself and has worked for the American Immigration Lawyers Association. Contact our team of immigration attorneys based in Washington D.C. and Northern Virginia for immigrant and non-immigrant petitions, student visas, and any of our other immigration services.